31.5"w x 22"d x 14"h for superior baking characteristics and results. Heavy insulation for fuel efficiency. Easy cleaning porcelain and aluminized linings with one nickel plated rack. 3 rack positions with 2 3/4" between rack positions. Long life, 30,000 BTU cast iron “H” pattern oven burner combined with special “V” shaped baffle directs heat for excellent air circulation. 24,000 BTU “star” pattern top burners with no gaskets to leak. 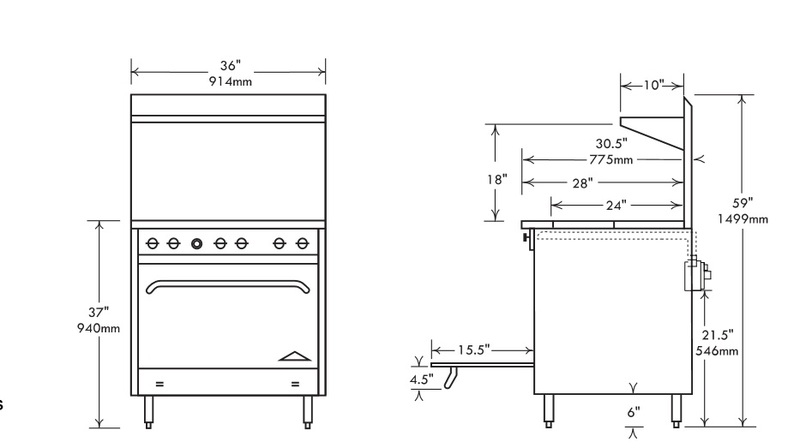 The large 7" flame spread offers a more efficient burn pattern for small to large pots. Full width crumb trays catch all spillage. Top grates are 12" x 12" cast iron with spillover bowl that also reflects heat for added efficiency. Designed for easy movement of pots across top sections. Stainless steel bullnose-rail is safely flush with the cook tops and functional to straddle pots, skillets and plates and also serves as control protection. Easy cleaning, corrosion resistant stainless steel finish, welded with angle iron and aluminized inner framing. Sturdy 6" heavy duty stainless pipe legs with adjustable feet. Double wall construction with heavy insulation for cooler operation. Installation clearances for non-combustible surfaces are 0" on sides and 0" in the rear, combustible surface clearances are 2" and 2". Includes 500° thermostat, 100% safety shut off, automatic standing pilot and brass top burner valves. Orifices and pressure regulators are set at the factory for the gas specified. Optimal pressures are 4" WC for natural gas and 10" WC for propane. Manifold size is 3/4" NPT. All controls are tested and confirmed in good working order. Calibration and adjustments are the responsibility of the buyer.